By Golly, the girl did it! I was so excited for today after hearing the peeping last night. However, every time I went out to check today, the nest was silent. I was worried that something had happened, but I didn't want to move her until we had the "maternity ward" finished. 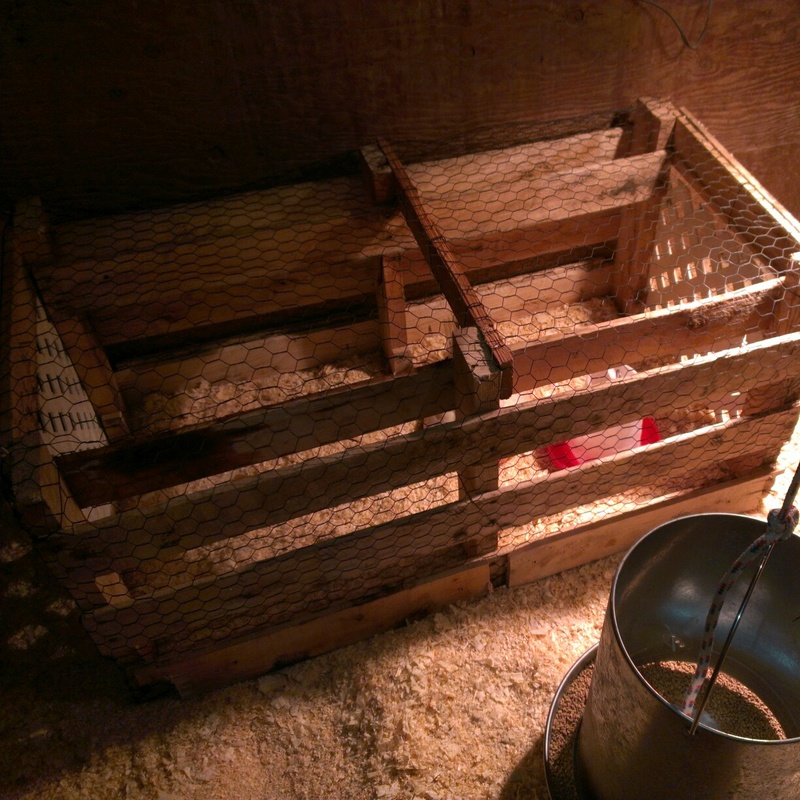 To keep the chicks safe from the other coop residents, Nathan built me a small cage that can easily be moved. While he was busy building, I went to work cleaning out the coop. 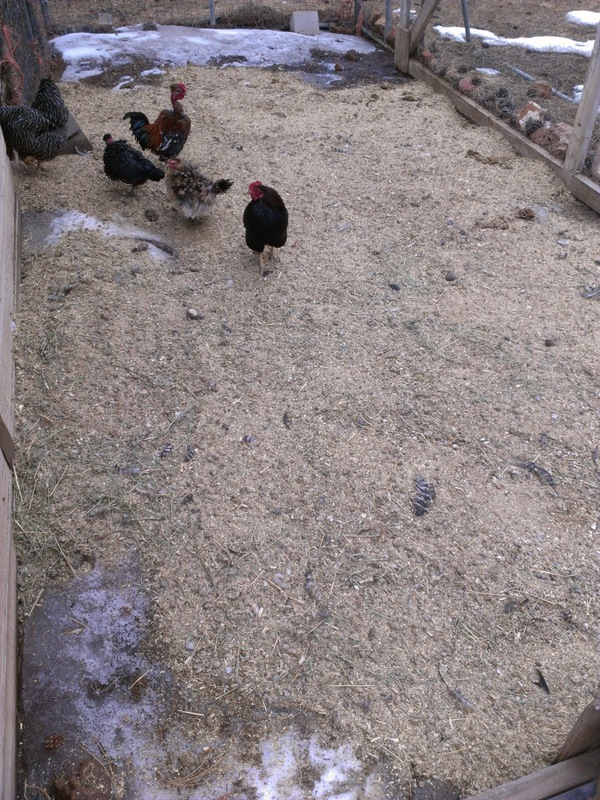 All of the hay, wood chips, and poop was shoveled out and fresh wood chips were added. 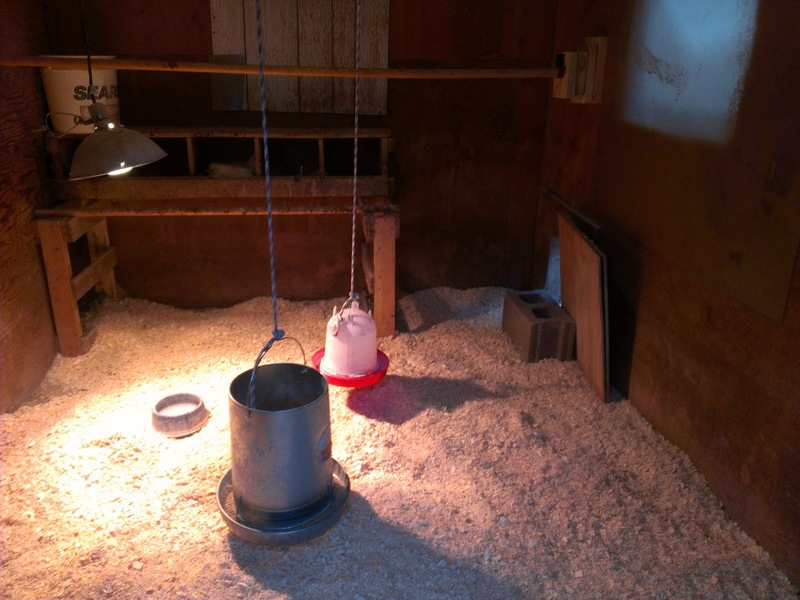 I prefer to use wood chips because it smells better and absorbs moisture better. The old stuff went into the run outside. It was so muddy and icy that the poor chickens weren't using it. Once the coop was clean, I gave the chick feeders a quick scrub and prepared the new area. 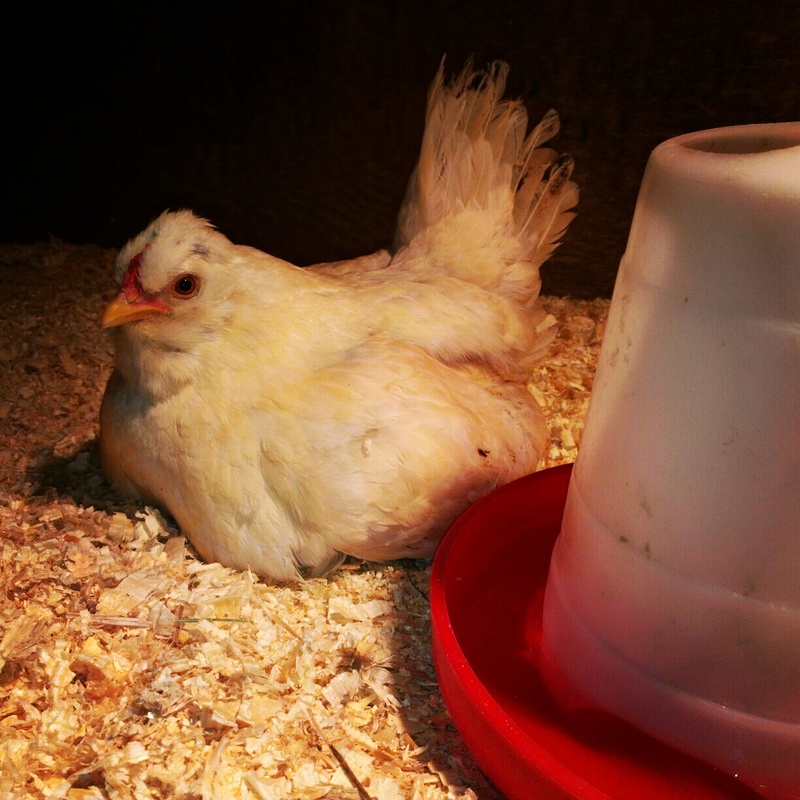 We placed it close to the heat lamp to help keep everyone warm. Nathan was the brave one and picked up the hen while I moved the eggs. She DID NOT want to be moved. Good thing Nate was wearing gloves or he might be missing some fingers. I set the eggs down, then her on top. I was excited to see the chick. I knew it had hatched because I could see the shell in the nesting box. However, it wasn't in the nest. I was completely at a loss of what could have happened. Did mama push it out and the other chickens eat it? Suddenly Nathan started laughing. 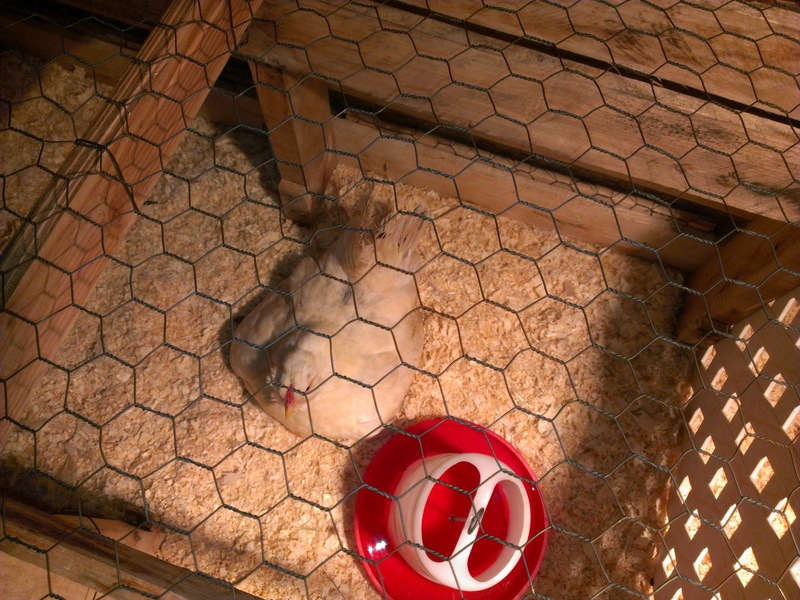 It had been tucked up under the hen and had been picked up with her. I didn't get a good look, but it's yellow, dry, and was standing. Good enough for me. From the sounds coming from the other eggs, there will be more babies to come very soon. If you look very close you can see a chick leg under her wing. I am completely in awe that in the dead of winter, this hen was able to hatch even one chick. Usually I don't name my chickens, but I'm thinking that she has earned a name. Any suggestions? Hopefully tomorrow the chick will venture out from under mom a little and I can get a picture. I like Gretta. I am afraid that I will become addicted to hatching chicks, it's so exciting. Congrats on the stove. If you order from Stoves and More be sure to tell them I sent you. That is so neat. I like this story. We have one hen laying right now but are purposely waiting for warmer weather before trying to hatch some eggs. 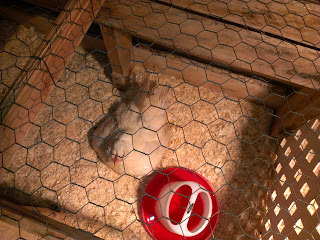 How neat to hear and see a baby chick...YES! in the dead of winter. I think momma should be named "Patience"
Greta means Pearl and she's done a pearl of a job! I think it fits. What an impressive hen you have. If Greta means Pearl I might have to save that name for my cow, Pearl's calf. Also, I can now hear two chickies, although she still won't let me see them. Its freezing out so I can't really blame her.